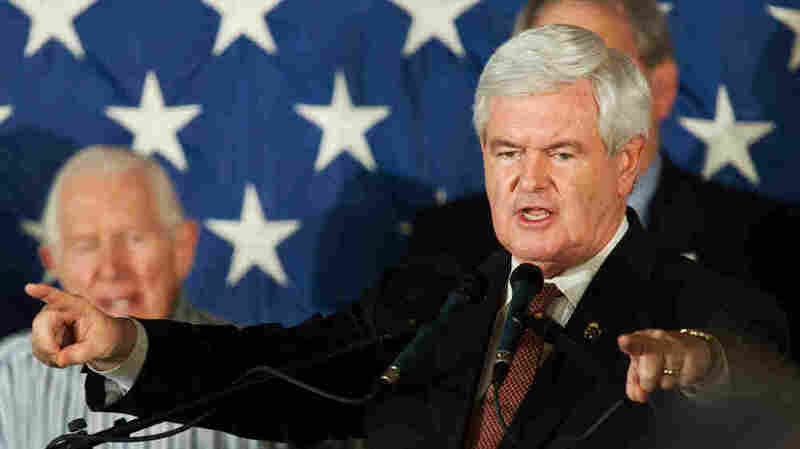 Gingrich Campaign Rides A Financial Roller Coaster Newt Gingrich celebrated his win in the South Carolina primary with a fundraising blitz — a two-day push to raise as much money as possible. The campaign says it brought in $2 million. That money will come in handy in Florida. But the need for quick fundraising shows the precarious state of the Gingrich campaign's finances. Republican presidential candidate Newt Gingrich speaks to supporters in Sarasota, Fla., on Tuesday. Newt Gingrich's presidential campaign celebrated his win in the South Carolina Republican primary with a so-called money bomb, a fundraising push to raise as much as possible. It was a success. But its importance also shows the precarious financial state of Gingrich's campaign. Spokesman R.C. Hammond says the campaign first set a target of $1 million, then doubled it and met it, all within 48 hours. "Most of that's coming in online, and a lot of it's coming in the mail. People are being very generous in writing checks. But what it means is that we're going to have the money to compete on the air, on television and radio, here in Florida," said Hammond. It's just-in-time campaign finance — the kind of thing politicians hate. But Hammond noted there are benefits in building a network of small donors. "It allows us to ... expand the reach of the campaign, but also expand the number of people we're reaching. If we can go back again and again to these folks, and as long as they continue to be generous to us, we will continue to be successful with the money they give us," said Hammond. Ever since he announced his run for the GOP's presidential nomination, Gingrich has been on a financial roller coaster. For a closer look at the spending currently under way by superPACs in early primary states, a journalism nonprofit, ProPublica, has created an online tool called PAC Track. The fundraising started out all right, although far behind the then-front-runner, Mitt Romney. Donors then seemed to give up on Gingrich, only to come running back when businessman Herman Cain left the race. The Gingrich campaign says it raised $9 million in the fourth quarter. And yet by last week, that money was pretty much gone. Gingrich's campaign manager, Michael Krull, fired off an email plea, writing, "we're surging and in position to win South Carolina. But we've still gotta raise about 100K to fund our TV ads the next 24-48 hours," asking voters to help the campaign "get these last critical ads on the air." And at a press conference, Gingrich begged for cash too — right after slamming the traditional analysis of money as a measure of political strength. "Are there things going on in America that don't fit the consultant big money model?" he asked. "Now, having said that, let me take this opportunity with all of these cameras to say, we would love to have anybody who'd like go to Newt.org to donate. It would be very helpful, and it will make Florida work much better." Actually, to make Florida work better, the Gingrich camp will need a lot of money, fast. "If you've got it, you'll be spending it in Florida," said Ken Goldstein of Kantar Media's Campaign Media Analysis Group. "TV advertising is going to be much more important in Florida, because it's a big state, and they only got seven days." A "big state" means more than 800 miles from Key West to Pensacola, 10 media markets and $1.6 million a week for a good TV ad buy. This Monday, Gingrich got a big break. It was disclosed that a donor is giving $5 million to the pro-Gingrich superPAC, Winning Our Future, an independent operation run by former aides. Casino owner Sheldon Adelson and his wife, Miriam, at the Marina Bay Sands complex in Singapore in June. 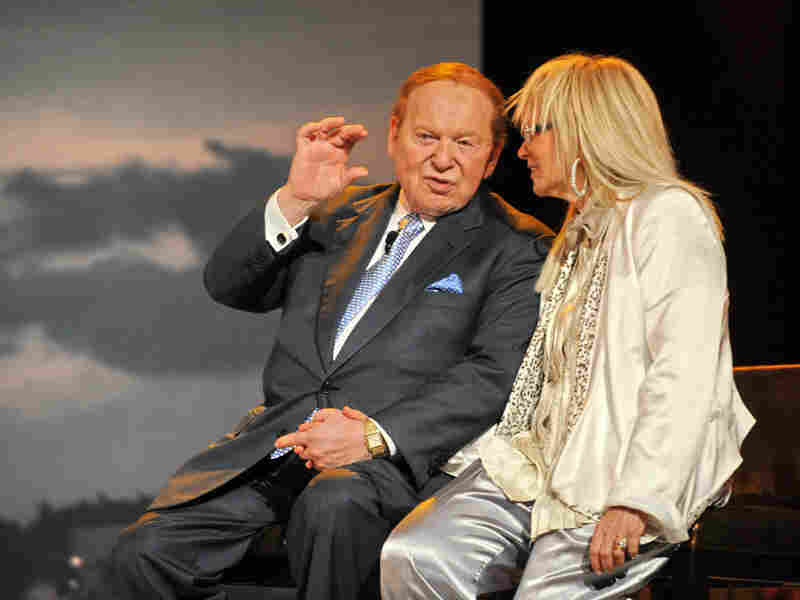 The Adelsons have donated $5 million each to the pro-Gingrich superPAC Winning Our Future. That donor is Miriam Adelson of Las Vegas. Her husband is Sheldon Adelson, a casino billionaire who gave the superPAC $5 million just two weeks ago. Goldstein says that Sheldon Adelson's money helped put Winning Our Future's pro-Gingrich ads on the air in South Carolina, something the campaign itself was struggling to achieve. "Winning Our Future aired about twice as many ads [as] Gingrich did. So, of ads aired on behalf of Newt Gingrich or against Newt Gingrich's opponents, 2 out of 3 were Winning Our Future," said Goldstein. Winning Our Future goes up on Florida TV Tuesday. with $2 million worth of postal mail, email and TV. So that $5 million from Miriam Adelson looms large right now. "Large infusions of cash from one or a small number of donors can be the difference between a campaign being viable or being ineffective," said John Green, a political scientist at the University of Akron. There may be other multimillion-dollar donors like the Adelsons. But we won't know until disclosures are made next week and next month. A source familiar with Miriam Adelson's contribution tells NPR that she does not want her money used for attack ads. It's hard to predict what effect this will have on the messages from those who are trying to make Newt Gingrich the Republican presidential nominee.